Last summer, Sébastien Metenier traveled to Ladakh in the Himalayas with Vintage Rides. And it’s a good thing that he’s used to film in tricky conditions. It allowed him to make a motorcycle video in Ladakh to immortalize his journey. The result is pretty good, and the images make us dream. Here is the video, followed by an interview with Sebastien. Hello Seb. Thank you for sharing your video with us! 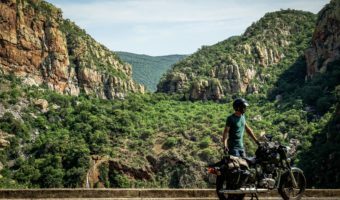 Was it the first time you’ve filmed a motorcycle tour or do you have any previous experience? Hello Etienne. I’ve been a professional cameraman in winter sports and tourism for the past 15 years. I had already filmed a short clip in Argentina for Harley and one of my favorite movies is Easy Rider. So I had lots of fun filming on the tour, even if it was complicated at times. Fortunately, the mechanics could drive the motorcycle from time to time so that I could get some nice rushes. You chose to go to Ladakh in the Himalayas. Why did you choose this trip over another? The real reason is my uncle Jean-Pierre Rustan who told me about this trip 6 months before its start. I immediately said yes. For me it was an opportunity to spend some quality time with the family as I moved far away a long time ago. Furthermore, this destination is really unusual for me. I love the mountains but I usually go to places where you can ski. I thought it was a great idea to ride a motorcycle in the Himalayas. 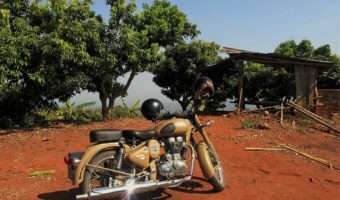 Was it the first time you went on a Royal Enfield motorcycle tour? How do you feel about this bike after the trip? Yes, it was the first time I drove this type of motorcycle... actually it has been one of the rare occasions where I’ve really been driving a bike since I got my license when I was 18. And now I’m 40. I had quite some apprehension but it was a real pleasure to ride this bike. You can drive it as easily as a scooter (which was my great passion as a teenager!). This bike inspires a real sense of freedom and I love the sound! In your video, you mentioned the subjects of spirituality and religion twice. When you discover such a place with immense, natural, idyllic landscapes amidst a population for whom meditation is a big part of life, does it inevitably lead to spirituality? Yes, it was surprising. In our group, nobody believed in God and yet everyone still felt an intense spirituality. I really loved the temples and villagers who pray all the time! It's really mystical! In terms of physical effort and cultural discovery, to whom would you recommend this trip and to whom would you not? You have to be well prepared physically as the passes can be very challenging. I regret not having listened to our guide who advised us to ride up slowly. It suddenly woke up an old shoulder injury and I had to give up the bike to ride in the back-up vehicle for a while. But it was still really magical, being able to walk a few meters and touch the snow at over 5600m in the middle of all these prayer flags. It’s definitely a memory I’ll keep for life! Is there a moment from the trip that you’ll particularly remember? There was a morning in a camp in the valley of the Indus River where I was awakened by a distant music. All the others were still asleep. I met our Indian host who gave me a thermos of hot water and I drank an Argentine coffee a little further away from the camp. 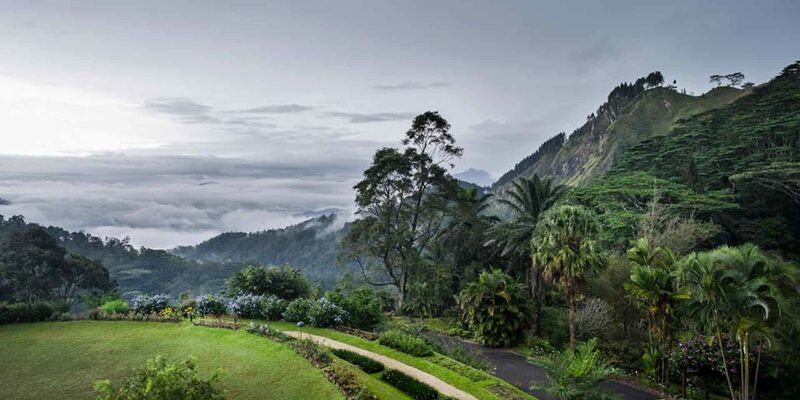 Once out of the small forest, the view on the valley was stunning and the music turned out to be the singing of prayers! It was magical to experience this surrounded by this breathtaking nature. According to our guide Ravi, it’s in this valley that our riding was the smoothest. We had a fairly steady pace; perfect curves and the whole group of bikers synchronized behind Ravi. Thank you for your time Seb! We hope to see you again soon. I’d like to thank Ravi. He is a great guide and has done an amazing job. I’d also like to thank my uncle Jean-Pierre who invited me on this great trip! 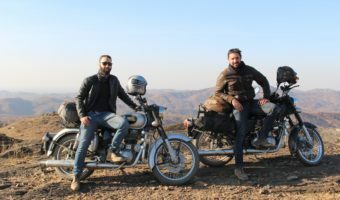 To discover our motorcycle tours in the Himalayas or any other Royal Enfield tour in Asia, don’t hesitate to visit the motorcycle tour page of our website.